Originally published in 1907, this title was one of several influential textbooks on nursing written by Isabel Hampton Robb, a nursing theorist. The first superintendent of nurses at Johns Hopkins School of Nursing she helped to found key organizations for nurses in the USA. Her work in nursing has led to her being thought of as a founder of modern American nursing theory, and many of the standards she implemented are still in place today. Hampton also played a large role in advancing the social status of nursing, previously thought of a profession for the lower classes. Her work in developing a curriculum of more advanced training during her time at the Johns Hopkins School of Nursing raised the status of the profession. 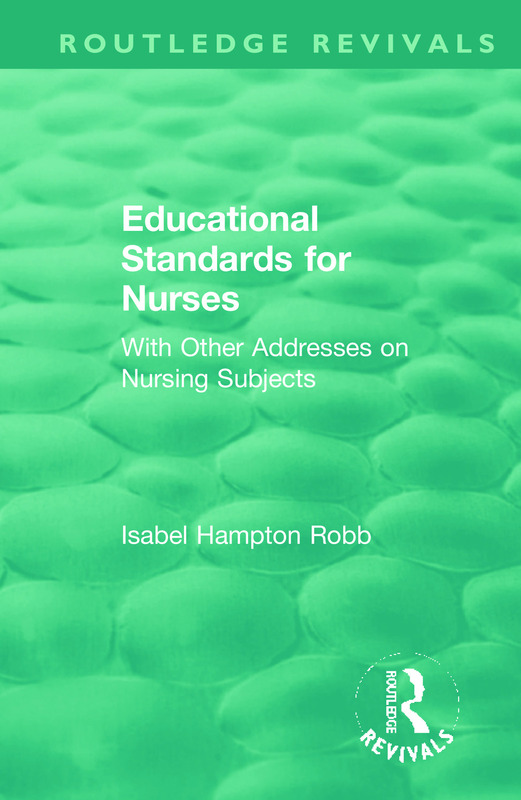 Nursing education today would not be what it is without the contribution of Isabel Hampton Robb. 1. Educational Standards for Nurses 2. The Aims of the Johns Hopkins Training School for Nurses 3. District Nursing 4. The Three Year’s Course of Training in Connection with the Eight Hour System 5. Nursing in the Smaller Hospitals and in Those Devoted to the Care of Special Forms of Disease 6. Modern Hospital Nursing 7. The Aims, Methods and Spirit of the Associated Alumnae of Trained Nurses of the United States 8. Hospital Economics Course, Teachers’ College 9. Report on Hospital Economics Course 10. Some of the Lessons of the Late War and Their Bearing on Trained Nursing 11. State Registration 12. Women on Hospital Boards 13. The Quality of Thoroughness in Nurses’ Work 14. The Affiliation of Training Schools for Educational Purposes 15. The Nurse as a Citizen.